Plug-in hybrid version of the latest Cayenne is well priced and has the most power. 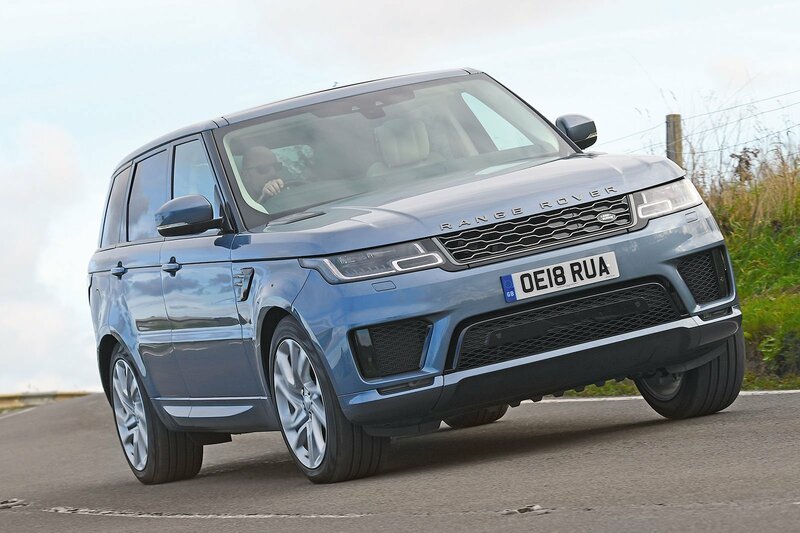 Facelifted version of the UK’s best-selling luxury SUV promises up to 31 miles between charges. Not quite such a posh badge, but the range-topping XC90 is fast and well equipped. Way back at the genesis of the horseless carriage – or the motorcar, as we refer to it today –a debate raged about what should power it. Some said stick with the tried and tested means of steam; others championed a newish fuel, petrol. But the real progressives wanted new-fangled electricity to lead the charge. That’s right: just a few years after Thomas Edison’s literal light-bulb moment of 1879, a chap called Thomas Parker was already plugging in the first production electric car. Anyway, there endeth the history lesson. The point, however, is that by now you’d think we’d all be scooting about in electric vehicles, yet the pure electric car is only just coming of age in terms of range. For a truly all-purpose vehicle, you still need to pair electricity with a traditional combustion engine, hence the hybrid. With interest in hybrids almost matching that of SUVs, this might just be our most electrifying test yet. First up is the Volvo XC90 T8. Like the other two contenders, it’s a plug-in hybrid electric vehicle (PHEV). A PHEV gives you a battery large enough for a relatively short electric-only range, sufficient for a typical school run or short commute to work. Once the battery has been depleted, the car seamlessly swaps to the regular engine, which in this case is a pokey turbocharged and supercharged 2.0-litre petrol unit. That’s the same size as the petrol engine in the Range Rover Sport P400e, although here it’s just turbocharged. This is the facelifted Sport, which, along with a more powerful electric motor and software updates to better integrate it, gets the infotainment system from the sleeker Velar. Third up is the brand new Porsche Cayenne E-Hybrid. It’s bigger than the outgoing Cayenne and bursting with more technology than ever before. It also has the biggest and most powerful engine of the three: a turbocharged 3.0-litre petrol V6. The first test of a hybrid’s performance is range: how far, on a full charge, will it travel on battery power alone? In our tests on a variety of roads, the Sport managed the longest distance of 18.4 miles. There’s a caveat, though: this figure was artificially augmented (slightly) by the fact that its petrol engine couldn’t be prevented from kicking in up the steeper inclines on our route. The other two had enough oomph from their electric motors to get them up unaided, so the Cayenne’s 17.4 miles and XC90’s 17.6 miles are more representative. On electric power alone, the performance of all three is reasonably sprightly and they can each do more than 70mph, but for their ultimate pace you need to cross the streams and work their electric motors and petrol engines in tandem. We’ve already mentioned that the Cayenne has the biggest engine, so you probably know where this is heading: it’s easily the quickest. 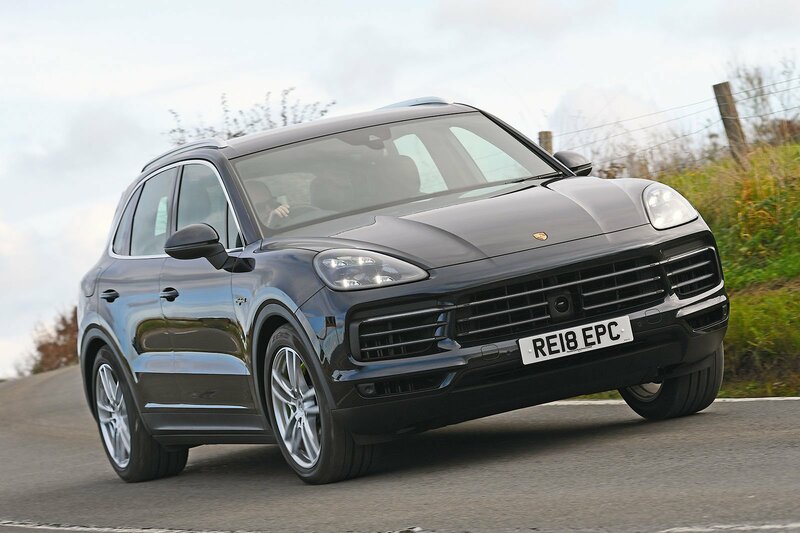 in fact, the Cayenne has the kind of flat-out acceleration to worry the most powerful of hot hatches. The XC90 can’t match that, but it’ll still outpace the Sport, whether you’re pulling away from the lights or putting your foot down to overtake. That said, even the Sport is pretty nippy when you extract all it has to give. You can’t fault how smoothly all three manage the transition between electrical and petrol power; you rarely feel it happen. Progress tends to be the jerkiest in the Sport, but that’s its gearbox occasionally shunting between ratios. And while its engine is noisier under acceleration than the XC90’s, it’s far from harsh. However, there’s no doubt that the Cayenne’s creamy V6 has the most alluring tone. The brakes on many hybrids can be inconsistent and grabby, due to their energy recuperation systems. However, the XC90’s brakes are pretty smooth, and the Sport’s, too, are far from unmanageable. Sadly, the Cayenne’s brakes are like a switch. Press the pedal lightly and nothing happens; a tiny bit harder and you’re almost garrotted by the seatbelt. It’s hugely annoying and isn’t easy to drive around, even with practice. At motorway speeds, each of our trio will ensconce you in a bubble of relative calm. All three generate just a soft flutter of wind noise, but the Sport has the most ‘slap’ from its tyres over expansion joints and harsher road roar than the Cayenne. 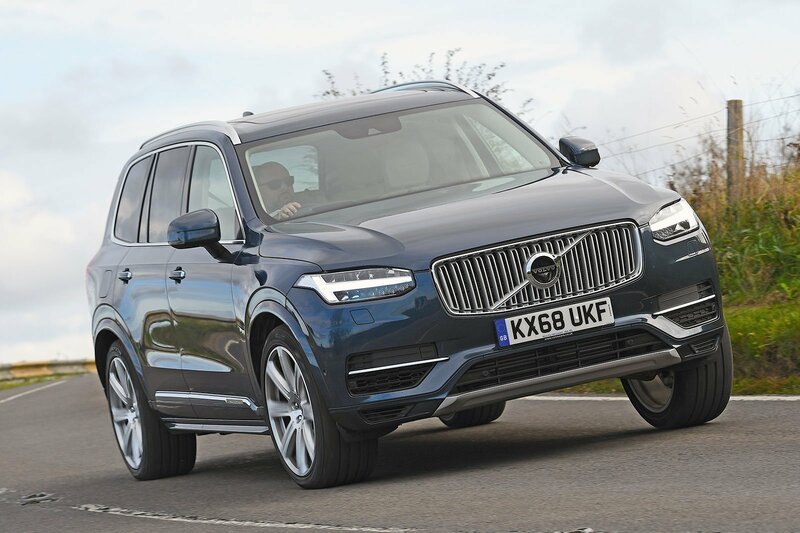 The XC90 is the quietest, but this isn’t usually a strength of Volvo’s largest SUV; it’s either a result of the hybrid’s packaging, or the particular wheel and tyre combination fitted to our test car. In terms of ride, the XC90 is the most softly sprung, so it’s the most comfortable over larger road undulations and at high speeds. But it also sways from side to side the most, and if you hit a particularly sharp intrusion, you feel a shimmy through the body. Under the same conditions, the Sport displays a similar but shorter-lived reverberation. Being firmer, it also sends fiercer impacts pulsing through the seat. However, neither is uncomfortable. The Cayenne is, on balance, the best-riding car, though. For starters, its body feels more rigid, so there’s none of that shimmying. 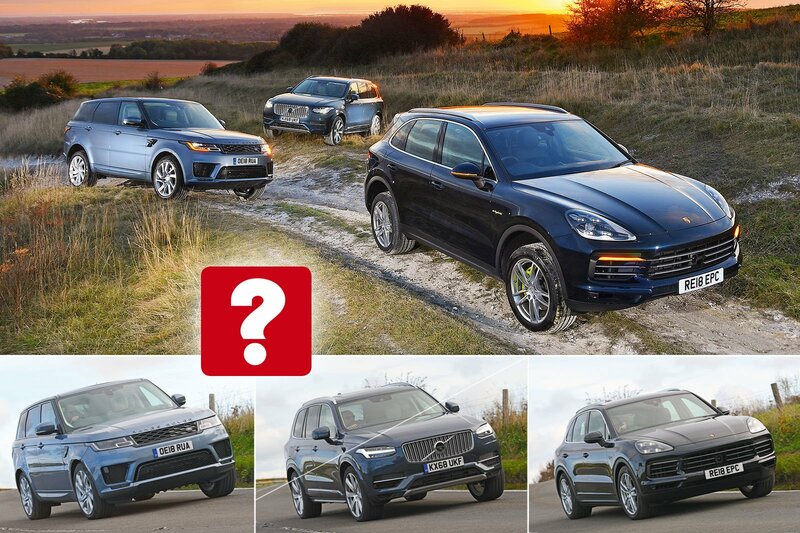 Like any tall SUV, its body still rocks about a bit, but less so than the XC90’s, and while it’s nearer to the firmness of the Sport, there’s more compliance over big bumps. The Cayenne handles far better than its rivals, too. Considering that all these cars are carrying more weight than the regular versions, due to those batteries and motors, the Cayenne’s dexterity in corners impresses. You can really hustle it along and derive satisfaction from the grip and poise it displays and the sense of connection you get through its hefty, accurate steering. That said, the steering is unnecessarily heavy at town speeds. The Sport has the best-judged steering overall; it’s accurate and feelsome enough at higher speeds but light enough in town. However, the Sport is the heaviest car here and, as a consequence, its tyres struggle to keep it glued to the road. It runs out of grip alarmingly early through bends and leaves you with the impression that the only thing sporty about the car is its badge. The XC90 makes no pretence at sportiness. Its body leans considerably through corners, and the steering seems almost rubber-jointed, so limited is the feel provided in corners. However, the steering is the easiest to twirl in town, and the XC90 has more grip than the Sport, so it can carry more speed through corners.